I just completed my first project on the Nomad 883 and I made an instructable about it if anyone wants to have a go making it themselves. 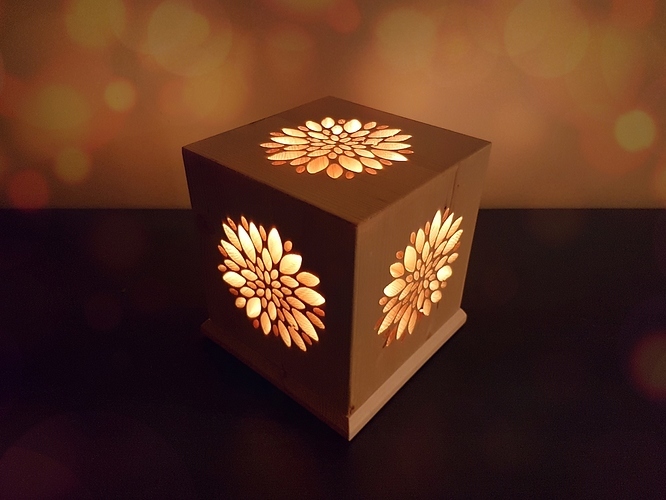 It is an LED meditation cube made out of pine. It also works great as a night light. All of the design files are included in the instructable if you just want to get started milling it out. It was tons of fun building and really got me acquainted with my beautiful new nomad. Congratulations on your 2016 authoring award with Instructables.com. I’m building a cube but having difficulties with the 3/4" pine in combination with my 1/8" ball nose cutter. I’m looking at your Fusion 360 file now, with hopes that I can figure out how to reduce the material thickness to 1/2". Then I plan to try the same design with 1/2" MDF. Any suggestions on how to approach Fusion 360 to achieve this would be fantastic, as I’m still working my way through the tutorials. Sorry for not responding to your comment on instructables I just saw it today. Sorry you’re having so much trouble cutting the 3/4 inch pine with those settings. They worked out pretty well for me when I did it, but I have also learned a lot since then and would probably make some adjustments as well. I have learned that enabling the water down finishing pass does wonders for making the job go smoother when it does the parallel finishing pass. Setting the Surface angle limit to 20 and the min surface angle to 30 also helps a lot. This makes it so that the cutter does not pull up on the steep side walls. One thing I would probably do now is create three mesh cam job files in order to use the Ball mill for the water down finishing and the square end mill for the rough out, parallel finish, and pencil cleanup. On the parallel finish with the square end mill I would set the stepover to 0.05. So for the first file you would just select the roughing pass with square endmill and generate the g-code. Then just select waterdown with the ball end mill and generate g-code. Then just select the parallel finishing pass and pencil cleanup with the square endmill again and generate g-code. A little annoying to make 3 files but I find makes jobs quicker when you still want the nice sloped edges with the ballmill. Oh and also during the rough out operation I find using a stepover of 0.110 works well. As far as the fusion360 file. You should just be able to select the inner faces of the cube and offset them by a quarter inch using the press/pull function. Then right click on the body in the left hand bar and select save as .stl to bring into mesh cam. Hope this helps and isn’t to confusing. I am in the same boat as you learning by trial and error right now. But I have definitely picked up a lot with the help of the carbide ppl over the last couple months. Someone had trouble with the F3D file so I loaded a link in the instructable where you can download the file from the Fusion3D cloud. Yes each piece in the file is a separate body. You should be able to just select the press/pull function then select the inside face of the cube and type in 0.25 inches to offset it. I couldn’t get the F3D file on Instructables to work either but the link to the cloud you provided there worked great for me. The F3D zip file unpacks to two folders and a dat file but no F3D file. The F3D file was downloadable from the Fusion cloud no problem. I’ve got my modified STL files now and ready to try again. If all else fails I can always print it on my 3D printer…LOL. Awesome! Let me know how things work out this time. Hopefully goes a little smoother lol. I’m making progress and still learning as I go. My last test piece was the top of the lamp and everything went as planned except for the design didn’t cut all the way thru and looks like I need to 1) level my spoil board and 2) Increase my Maximum depth of cut. I wanted to ask about the 3 file suggestion. I read in the forum about tool changes and storage of the x y offset in Carbide Motion. Is that the secret for running the 3 separate files as well? Do you use the stored x y offset prior to running the remaining 2 files? Yeah I had an issue with my wasteboard not being level as well when i started. There is a forum topic somewhere on here that shows you what to do in Carbide create to plane the top surface of your wasteboard. If you are using the ballmill as your primary tool you will have to increase your max depth of cut more than if you use the square end mill. Thats one reason the square end mill ends up being better for most of the cut operation. With the square end mill you can increase the max depth of cut slightly thicker than your stock thickness and the should cleanly cut right through. Yes your right with the 3 job files. All you do is load the first job file and jog the cutter to zero your x, y, and z. When the first job file completes you just load the second file and click run right away. You can change your cutting bit before or after, doesn’t matter. Carbide motion remembers where the x, y, and z were zeroed, so you don’t need to do it again for the following job files. you can even turn the nomad off and it will still be zeroed to where you last had it. Each job file has the same x, y, and z position so just zero the first job file.